Lana Wood was born Svetlana Gurdin (of Russian parents) in 1946, the younger sister of actress Natalie Wood who was tragically drowned in a boating accident in 1981. Plenty O'Toole appears in just the one scene where she is thrown, half naked, from a hotel window into a swimming pool, but originally there were two more scenes that unfortunately didn't make the final cut (athough they are available on DVD). Walt Disney's Justin Morgan Had A Horse (1972) was Lana's next film and, in the next ten years, there were many TV appearances. These included Nightmare in Badham County (1976), Little Ladies of the Night (1977) and the CBS daytime drama Capitol (1982) in which she played the middle-aged matron Fran Burke. Lana Wood retired from acting in 1982 to concentrate more on her career as a producer. 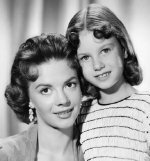 Natalie's success as a child film star, inevitably led her sister to follow a similar path. 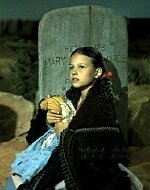 Lana had her first film role as a 10 year old in the John Wayne film The Searchers (1956). Lana plays the younger version of Natalie's character Debbie Edwards, and the film has become a cinema classic, with the American Film Institute listing it among their 100 best films ever made. 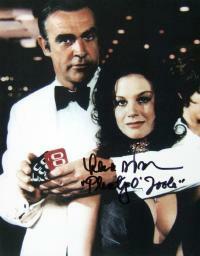 I met her again at Starcon in September 2006 when she signed my Diamonds Are Forever lithograph. Lana's early TV appearances included Dr Kildare and The Fugitive in 1964, but it was her long standing role as Sandy Webber in the soap opera Peyton Place that established her as the hard and feisty character that she later portrayed in Scream Free! (1969). 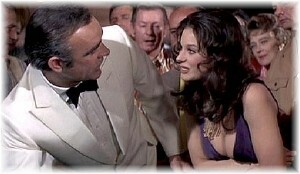 Cubby Broccoli first noticed her in 1971 and she was invited to audition for the James Bond film Diamonds Are Forever. As Lana Wood recalls in an interview, "Well, I went on an audition to play Tiffany Case, but they told me there was pressure to use someone else. Then they offered me the role of casino girl Plenty O'Toole, and I said, "Absolutely. I'll be happy to." Then I got the script and said, "Oh, dear." She was written as someone who could easily be disliked...so I decided to make her very big-hearted, and very naïve, and very simple. I even spoke in a higher voice as I didn't want anything about her to be heavy or premeditated. I told all this to [Diamonds director] Guy Hamilton, and he told me to do whatever I wanted." I first met Lana Wood at Collectormania in Milton Keynes in 2004 when she signed a photograph for me and also my Bond Girls book which you can see her holding in the photo above. However, she found time to write the best-selling biography, Natalie: A Memoir By Her Sister, which was published in 1985.